The first British ocean race was inaugurated in 1925 and was called the Fastnet Race because the course ran from the Isle of Wight, down the Channel and across part of the Atlantic to the lighthouse on the Fastnet Rock, off the southwestern Irish coast, before returning to Plymouth. The race, which has been called the Grand National of ocean racing, was started by a group of hardy sailors in 1925. Only seven yachts started the 605 mile course on August 15th, which was won by the "Jolie Brise", in a time of 6 days, 2 hours and 45 minutes, having ghosted through calms and fog. Not so lucky were the trailing boats, which got caught in a gale neat the end of the race. All eventually made it to safety, but their rough treatment was a fore state of the perils that the Fastnet race would offer future contestants. 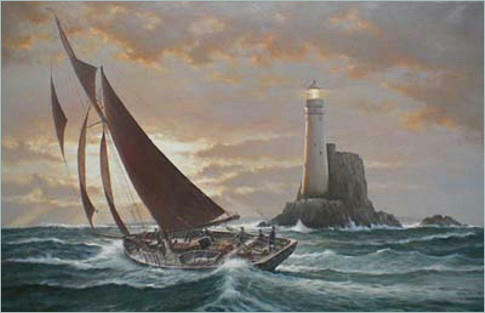 "The dramatic image of the Jolie Brise rounding the Fastnet Light had been on my mind for some time, but it was the events of the year 2000 that spurred me into committing it to canvas. Whilst doing the research for the painting I had the opportunity to go on board and get the feel of this historic ocean thoroughbred and I hope that I have managed to reflect the spirit that I felt in her."